Lubor On Tech: Is Device Convergence Happening? 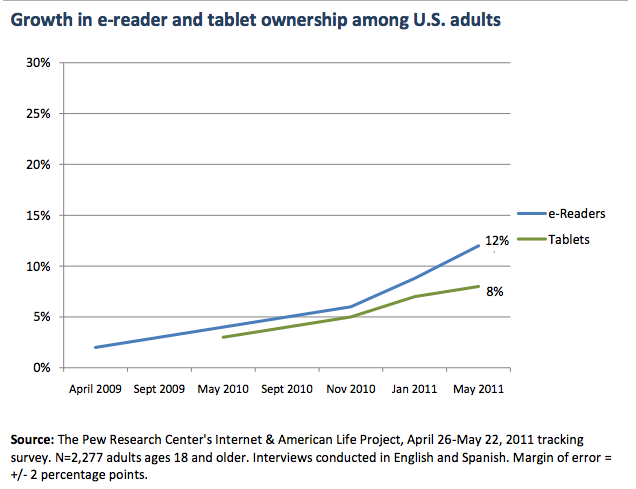 A few days ago, a report by Pew Internet came out that revealed a surprising statistic about e-readers. 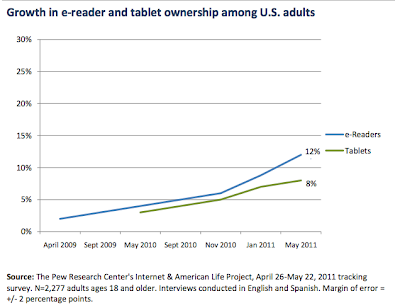 According to the data Pew presented, e-readers such as Kindle and Nook have reached a 12% penetration among the US adult population. That’s actually not bad even though it is far behind other devices such as mobile phones (83%), laptops (56%), and MP3 players (44%). But this number is way ahead of the tablet penetration which is still relatively low with 8%. That effectively means that the iPad didn’t at all manage to kill the Kindle. I must admit, that when the iPad first arrived, I thought it would mean the end of the Kindle. You can read books on the iPad and Amazon even provides a very good Kindle reader app for iPad. And after all, how much does Amazon really care about the Kindle? They make money no matter what device I read their books on, right?. I suppose the e-book readers are doing so well because they are really good at what they have been designed for. They are single-purpose devices optimized for their job. For reading books, some of their advantages include the screen that allows reading in bright sun light, the ease of e-books dowloading and, my favorite, the light weight. All the tablets I have tested so far are too heavy for reading in bed. Kindle is featherlight with its 241 grams (8.5 oz) and it makes reading in bed easier than with a paperback. This is really begging the question about convergence. Are we going to end up with a single device that can do it all or are we going to keep a multitude of devices? Convergence is definitely appealing, if nothing more than to eliminate the clutter of power chargers and adapters that I complained about while packing for vacation last summer. But having the right tool for the right job is unquestionably not a bad approach either. Are we going to dump the e-reader and read on an iPad? Maybe, if it becomes lighter and learns how to handle the glare. Or maybe the e-book readers will add the apps and blur the line between tablets and e-readers. But how about the convergence of other devices? Do I no longer need a watch because I have a smartphone that can tell the time? Well, I am really attached to my mechanical watch. Are we going to throw away the GPS and use the iPhone instead? Yes, it works, but the dedicated GPS is still a little easier to use while driving. How about the laptop that I keep schlepping around together with my iPad? If I had a keyboard and a mouse, I could perhaps get rid of it. Couldn't I? Well, I don’t know what the answer is but I do know that the key is going to be the user experience. The simplicity and compromise-less user experience - software and hardware - will determine whether or not a particular device will converge. If a device doesn’t give me the right experience, the convergence won’t happen, even if the functionality is there. Over the long haul the number of technology device formats has ALWAYS increased Lubor. Certainly some formats have waned or converged with others - electronic organizers come to mind as an example - but I have far more gadgets than my ancestors. I don't see this changing. Indeed with further miniaturization I can see clouds of devices (e.g. a personal mobile network) doing what one device does today. You are right about user needs. I can see future devices being far more adaptive to user needs and able to understand various approaches to I/O, and sharing what they have learned about user-specific quirks with other devices belonging to the same user. Agreed that UX will be key to determine where and how convergence will occur. Devices with better UX for a given user segment, need, and usage context will prevail, but no one device will ever "rule them all".